There is a $50 charge for a one time cleaning that takes up to an hour to service. Current NO DOODY Family Members enjoy a $15.00 discount on one time and emergency cleanings. NO DOODY Family Members are billed out on the 1st of each month for the previous months service. Receive a FREE week of service with every signed referral!! All new customers who sign up for weekly, twice weekly and every other week service will be charged an Initial Clean-up Fee. This is a one-time fee and is billed at $30.00. This charge is added to the regular service rate on your first cleaning. This fee is compensation for the extra time involved in cleaning your yard for the first time of accumulated pet waste. Thereafter, the normal rates above apply. NO DOODY Family Members are billed out on the 1st of each month for the previous months service. You may pay by check, credit card through the stripe link on your invoice or recurring payments. Customers are subject to a $10.00 late fee if payment is not received by the 15th of the month billed. Thank you for letting NO DOODY provide you with a cleaner and healthier yard for you as well as your beloved pets. 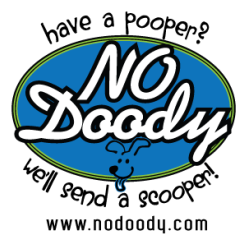 NO DOODY is the premier pet waste removal service in the New Orleans area and our customers will verify this statement. We have been cleaning up New Orleans one back yard at a time since 2010. There are several more yards to conquer so give us a call or sign up and join the hundreds of others already enjoying their backyards again.